See also a model from the National Museum of American History. Cartesian equation: (proving that the contour lines are ellipses), i.e. .
Volume of the milk carton: . Area of the milk carton when k = 1/2: » 7,29a2. Given two orthogonal non-intersecting lines (D1) and (D2), (H1H2) their common perpendicular, O the middle of [H1H2] and (C) a circle with center O in a plane parallel to (D1) and (D2), the milk carton is the non-developable ruled surface generated by the lines intersecting (D1), (D2) and (C); therefore, it is a conoidal surface. Here, (D1) is , (D2) is and the radius of (C) is ka. The lengths of the two double segment lines carried by (D1) and (D2) are equal to 4ka. 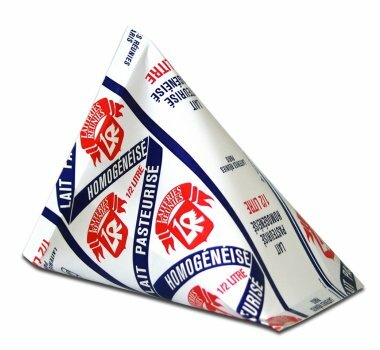 The milk carton is also the ruled surface generated by the lines (M1M2), and with two orthogonal sinusoidal motions in quadrature; the part shaped like a milk carton is the reunion of the segment lines [M1M2]. 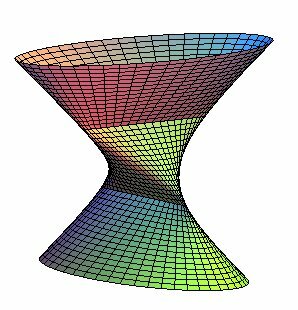 The length of the segment line [M1M2] then remains constant equal to ; the milk carton can therefore also be defined as the ruled surface generated by a line two fixed points of which slide on two fixed orthogonal non-intersecting lines. All the points on the line describe ellipses (which constitutes a generalization of the Proclus ellipsograph). The projection of the segment line [M1M2] on xOy also maintains a constant length: the view from above of a milk carton is therefore a full astroid. We also get a generalization of the milk carton by considering the conoidal surface generated by the lines (M1M2), , having two orthogonal sinusoidal motions with any phase difference. 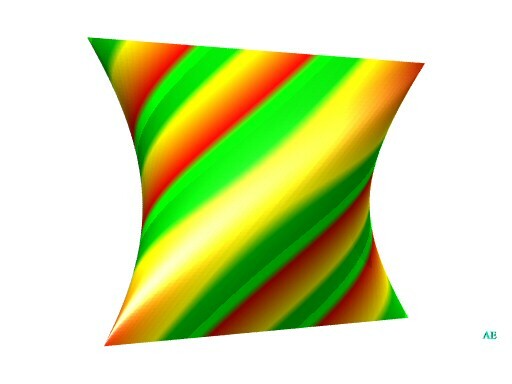 Compare to the conocuneus, as well as the Cayley cubic surface.